I recently saw a picture of a woman engulfed in tears, standing over the casket of her husband she lost in the Vietnam War. His body had been missing for thirty years. Now, finally, his remains had been found and brought home to American soil. For thirty years, this widow had no answers. For thirty years, she, doubtless, wondered whether he was truly dead or perhaps—just perhaps—alive somewhere. Finally, the truth, painful as it was, lay before her. She could stop wondering. Gazing at the picture, I thought about the pain we all will have to walk through in this life; pain that will not always make sense to us on this side of eternity. On a personal level, my husband and I have learned well in the last few years that the world can make perfect sense one day and then careen off balance the next. Our sense of innocence and safety was robbed from us by circumstances beyond our control. When all the pieces were left lying on the floor around us, we had no answers. God can handle our pain better than any human being. Unfortunately, we found ourselves indulging two false notions about God: either He must be disciplining us or, even worse, had abandoned us. I felt like we were living in a nightmare that was inescapable. Each day, I looked at my husband and children, wondering if we would ever feel true joy again. Like Naomi when she returned from Moab to Judah, I felt trapped in bitterness and pain. God can handle our pain better than any human being. Going through a crisis that we could not talk about with many people taught my husband and me afresh that our help and comfort must come, first and foremost, from God. One reason God sends us trials is to prepare us for future trials. God often graciously prepares us, unwittingly, for future trials. Two years before, we went through a health crisis with one of our children that shook our world but, ultimately, strengthened our faith. God knows every inch of path our feet will tread in this life. From beginning to end is marked by Him, and nothing takes Him by surprise—even if we feel blind-sided. He is there to strengthen us, comfort us, and grant us wisdom. The purpose of praying is to entrust our lives to God, not to get swift answers. When we pray, we can be sure our worries and cares are not only known to God, but surrendered to Him. He already knows our deepest concerns, but when we pray, we are acknowledging our dependence on Him. We may have to wait thirty years for clarity, or sixty, or . . . until eternity before we know exactly why we had to endure particular seasons of life. Yet, though it may seem the world has broken beyond repair, God is perfectly able to pick up the pieces when we cannot. Through the work of His Son on our behalf, He heals. He sustains. He enables us not only to continue existing, but to venture into a deeper relationship with Him and others. 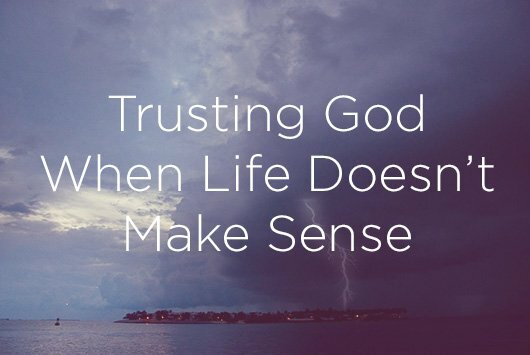 What has God taught you when your world has been shaken and circumstances don’t seem to make sense? Susanna Rose is originally from Toronto, Canada but now lives in Atlanta, Georgia with her husband and four young children. Writing about matters of faith and Christian living have always been her passion. Since earning a B.A. in English, she is humbled by opportunities God provides to further exercise this love. In between nurturing her little ones and keeping her house in some semblance of order, Susanna homeschools her five-year-old daughter and writes for LifeSiteNews. She enjoys running and sipping homemade lattes with her husband! Next Post Modesty, Beauty, and Men. Why Should We Care? I Wouldn't Have Chosen This, But . . .